Wondering how to allocate your budget to reach the most effective Facebook audiences? Facebook’s Budget Optimization tool uses an algorithm to automatically optimize your budget distribution across ad sets. 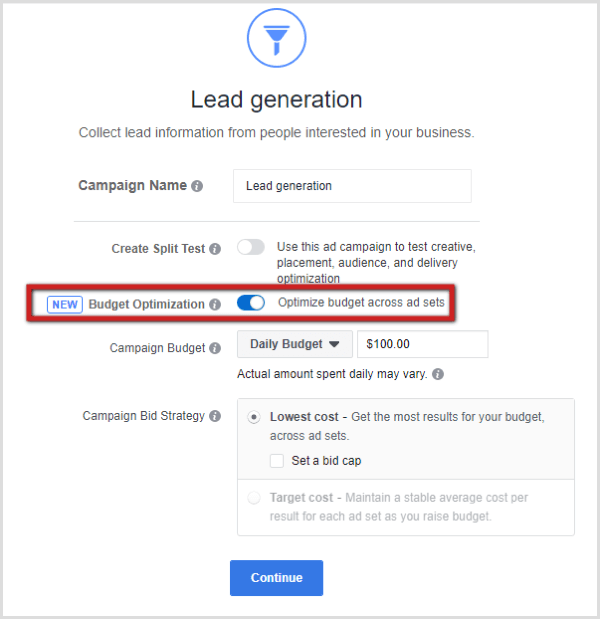 In this article, you’ll discover what the Facebook Budget Optimization tool offers, how it works, and when you should use it. How to Use the Facebook Budget Optimization Tool for Improved Results by Meg Brunson on Social Media Examiner. As with most aspects of Facebook advertising, the most effective way to identify what’s working best for your business is through testing. The same is true for identifying your ideal audiences. By setting up multiple ad sets, each targeting a different audience, you can gather data that will help you determine which audience is performing best within your current campaign. When you’re running ad sets with different audience sizes, it’s recommended to set budgets proportionally based on individual audience sizes. This helps ensure that your budget has equal potential with each audience. 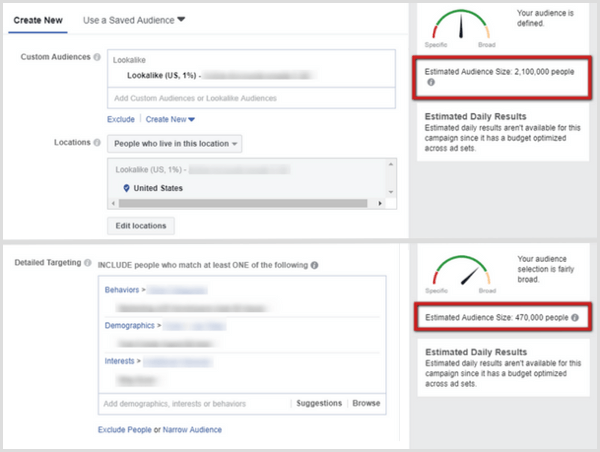 As you build out audiences using lookalike audiences or Facebook’s internal Detailed Targeting options, you’ll see your estimated audience size in the right-hand column. In the example below, notice that the lookalike audience has more than 2 million people in it, whereas the audience built from Facebook’s Detailed Targeting options has fewer than 500,000. Giving each ad set the same budget allows the smaller audience greater potential to reach a higher percentage of the audience than the lookalike audience. To proportionally allocate the budget across both audiences in this case, you should take your total budget and allocate approximately 20% to the smaller audience and 80% to the larger audience. This will give the budget the same potential for each ad set. An alternative (and much easier) option to figuring out all of this math is to use the new Budget Optimization tool. But before we get into that, I want to address another related situation presented by custom audiences. In light of the recent Cambridge Analytica scandal, one significant change that Facebook has made is indefinitely suspending the ability of marketers to see the sizes of their custom audiences. This means that when you remarket to custom audiences, you’re blindly promoting to an audience of unknown size, which can make determining a budget for audiences based on size extremely difficult. In most cases, remarketing audiences produce less-expensive and higher-quality results, which is why marketers love targeting warm audiences built from custom lists. However, this indefinite change announced by Facebook complicates things. Savvy marketers may attempt to estimate the size of the audience by running an ad to that custom audience and monitoring the reach and frequency to mathematically estimate how many people are likely in that audience. As the frequency approaches 2, you’re likely reaching a majority of the audience. Of course, this is only an estimate that requires time and money to determine. In this situation, Budget Optimization is an effective tool to leverage. Testing a custom audience against another audience type, such as an interest-based audience or a lookalike audience, allows you to set the budget at the campaign level and let Facebook identify the best way to allocate the budget across the two ad sets. Facebook recently began a rollout of the Budget Optimization tool. To use it, access the Ad Creation tool from Facebook Ads Manager. At the campaign level, toggle the Budget Optimization slider to On (as shown below). This will reveal additional fields to fill out, including campaign budget and bidding strategy options. When you set your campaign budget, you need to decide if a daily budget or a lifetime budget is most appropriate. Lifetime budgets work only if you set start and end dates for your campaigns. Note that if you select a daily budget, Facebook has some wiggle room to overspend by up to 25% per day, which they’ll compensate over the duration of the calendar week. So if your daily budget is set to $100, you may spend up to $125 on any given day, but you won’t spend more than $700 in a week. The budget you set at the campaign level will be applied across all of your ad sets. The more ad sets you plan to run, the higher this budget needs to be. Make sure it’s large enough to fuel all of the ad sets you’re running under it. Tip: A good rule of thumb is to consider what you would normally allocate to each individual ad set and add those amounts together to find your campaign budget. Currently, with budget optimization, you’re limited to using the lowest bid (formerly called automatic bidding) strategy, with or without a bid cap. If you want to proceed with target-cost bidding (formerly called manual bidding), don’t use the Budget Optimization tool. Typically, the best way to ensure you get the most results at the lowest cost is to select Lowest Cost without a bid cap (as shown above). Once you have your campaign budget and bid strategy set, you’re ready to build out your ad sets. At the ad set level, you choose your audience(s) and select your ad placements. Because you’ve elected to use budget optimization, you’ll notice some changes to the Budget & Schedule section. When you’ve selected budget optimization at the campaign level, these are the fields you’ll have available to further customize budget and delivery at the ad set level. At the campaign level, you’re able to choose a daily budget or a lifetime budget. If you choose a daily budget, you can decide whether to let your ad run continuously/ongoing, or set start and end dates. If you chose a lifetime budget at the campaign level, you select start and end dates here. With budget optimization, you can set spending limits on each individual ad set. Expanding that section allows you to set either a minimum and/or a maximum spend amount based on the budget you set at the campaign level. These limits can be used to ensure that all ad sets are receiving access to a portion of the budget, if that’s important to your campaign. If you set spending limits that are too strict, the Budget Optimization tool may not work effectively. In most cases, it’s suggested not to set spending limits until you’ve gathered enough data on each audience to make those educated decisions. Remember, budget optimization was designed to get you the most results at the lowest cost, and the default settings allow the tool to work most effectively. Now that your schedule and any other budget settings are ready at the ad set level, you can proceed to the ad level to build out your copy and creative. It’s a Facebook ads best practice to always test multiple creatives at the ad level. When you’re running more than one ad within the same ad set, you may have noticed that after 24-48 hours, one ad typically has a significantly better reach and results than the other(s). This is because Facebook’s ad algorithms automatically figure out which ad is performing best and serve that ad more often. Budget optimization allows the same type of automatic optimization to occur at the ad set level! 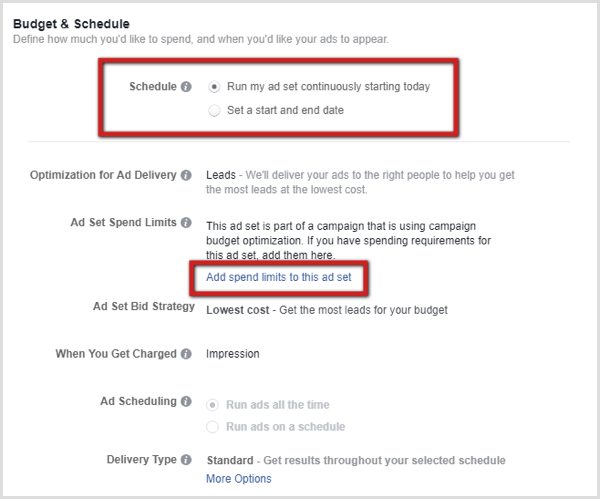 When you set a budget the traditional way at the Ad Set level, you’re telling Facebook to spend that specific amount on each ad set. This is an effective strategy if you know you want to spend the same amount on each ad set. However, if you’re more concerned with getting the most results at the lowest cost, you want to consider budget optimization. Facebook will automatically and dynamically allocate a higher percentage of the budget to the ad sets that are performing best so you spend in the most effective manner possible. Don’t want to take the time to manage your own social media? No problem! We are the experts here at Damonaz Design. Talk with us!